Nearly a full month after the album's release, Eminem is having trouble understanding why his Kamikaze LP largely fell flat with critics. Now, he's taken it upon himself to mock their criticism with a magazine ad. 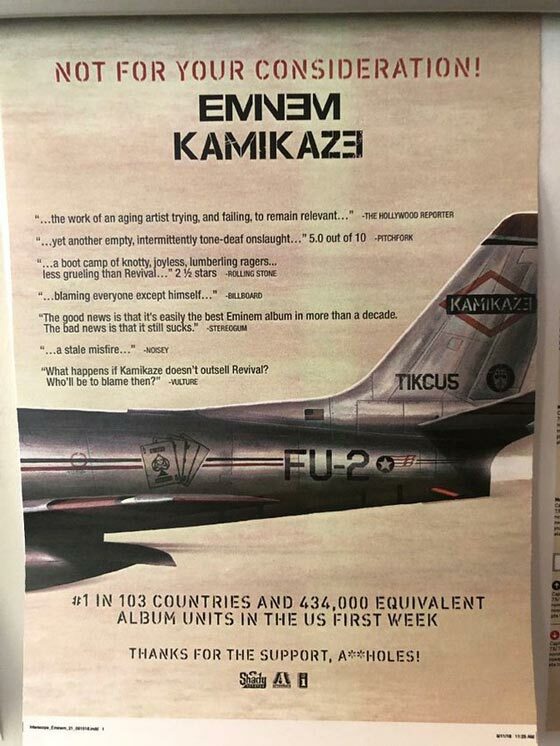 The full-page ad, seen above, was published in The Hollywood Reporter, and lines up six excerpts from Kamikaze reviews before boasting about the album's sales numbers. Leading things off is a quote from THR themselves, who called the album "the work of an aging artist trying, and failing, to remain relevant." Other quotes include Pitchfork calling the album "another empty, intermittently tone-deaf onslaught," while Noisey branded it "a stale misfire." The ad then points out that Kamikaze went straight to number one in 103 countries, and sold 434,000 units in its first week of release in the U.S. For good measure, Eminem then adds, "Thanks for the support, assholes!" THR editorial director Matthew Belloni tweeted a photo of the ad yesterday (September 20), writing, "Respect to @Eminem and his label for running this very funny ad...Is this the print equivalent of a diss track?" In addition to starting a beef with Machine Gun Kelly and lifting the artwork of a much more rewarding album, Kamikaze has also been maligned for Em's inclusion of a homophobic slur against Tyler, the Creator, though the MC recently admitted he took that "too far." Eminem recently responded to Machine Gun Kelly's diss track with one of his own titled "Killshot," though it was recently revealed that both rappers' diss tracks were produced by the same person.